The Obama Presidential Center, slated to open in Jackson Park in 2021, will include a Chicago Public Library (CPL) branch, according to a recent announcement by the Obama Foundation and the mayor’s office. As reported by the Chicago Sun-Times, discussions between the Obama Foundation and the CPL have been happening since 2017. “In the spirit of Barack and Michelle Obama, this branch will serve as a neighborhood anchor with 21st century learning opportunities and shared spaces that will bring together community residents to gather, share and succeed for generations to come,” Mayor Rahm Emanuel said in a press release co-written by the Foundation and the mayor’s office. According to the release, the library’s special collections and programming will have a particular focus on civic and community engagement. The library will also provide job training programs, study and research rooms, and meeting spaces. “We’re excited to partner with the Obama Foundation to create this new CPL branch, which will provide a place for South Side community residents of all ages to gather, share, learn and succeed,” CPL Commissioner Brian Bannon said in the release. The Center will not be connected to the federal presidential library system, and thus will not need to build or fundraise to the specifications of the government’s National Archives and Records Administration (NARA). Although no physical NARA-sponsored library will be built in Chicago, there will be an online NARA-run Barack Obama Presidential Library, fully digitized and accessible online to the public. The physical documents are currently stored in a NARA facility in Hoffman Estates, Illinois, that is not open to the public. 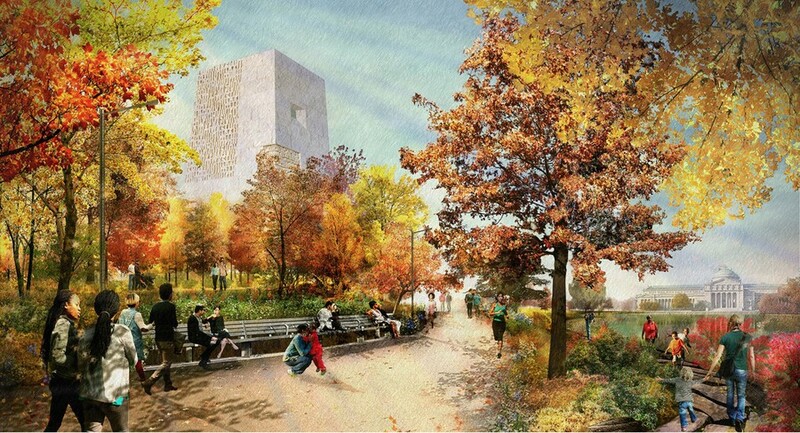 The University of Chicago has been involved with the planning and discussion of the Obama Presidential Center and recently made its first cash donation to the Obama Foundation. The University has no direct affiliation with the CPL and its libraries are not connected to the CPL system. In a document published last Friday, the Obama Foundation outlined its plan for the Center to provide a “net gain of parkland,” adding more land to the Chicago Parks district than it would occupy. The Center’s plans also call for the closing of a section of Cornell Drive, a busy six-lane highway which runs alongside Jackson Park. The closure is intended to provide additional parkland. The document also includes a short section listing ways the Obama Foundation will work to prevent residents of the area around the Center from being displaced. The Foundation says it will support “neighborhood stabilization efforts” and strive to build communication between residents and local government officials concerning vacant land use and preserving affordable housing. According to the document, “[the Obama Foundation] will support policies that ensure residents who wish to stay in the area will be given the tools that allow them to do so.” The document does not describe how this or any other of the Foundation’s commitments will be funded, however. On Monday, the Obama Library Community Benefits Agreement Coalition held a press conference at the South Shore Cultural Center, and the organization issued a statement in response to the document’s promises. Also on Monday, the Foundation announced changes to the Center’s design, which it said were in response to community feedback. The changes include the removal of a 10-foot curb extension into Stony Island Avenue and of a sunken courtyard in the plaza between the Center’s buildings. The new design moves the children’s play area closer to Stony Island Avenue and reshapes the Athletic Center—which will be 20-feet tall, instead of 18—to be more in keeping with the style of existing buildings in Jackson Park.